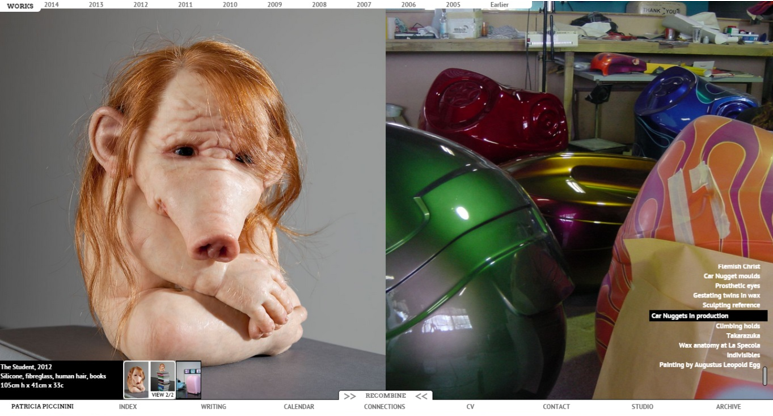 Patricia Piccinini lives and works in Melbourne, Australia. She earned a degree in Economic History before studying painting at the Victorian College of the Arts. In 2016, she received a doctorate in Visual and Performing Arts from the University of Melbourne, where she currently teaches. 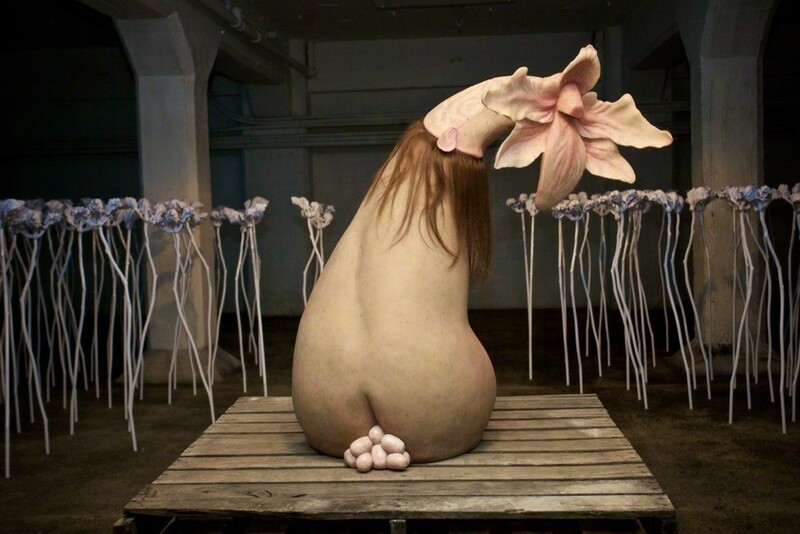 Piccinini’s work primarily explores the relationships between the natural and constructed worlds, creating hybrid creatures and machines that are simultaneously beautiful and grotesque. Focusing on ideas rather than methods, Piccinini translates her thoughts through a variety of media, including drawing, painting, sculpture, video, sound, installation, and digital prints. 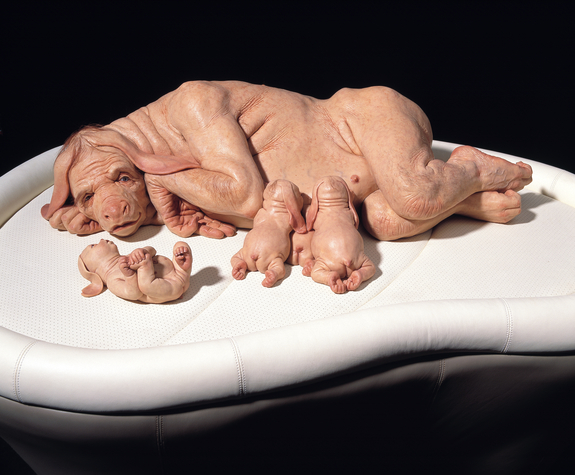 Piccinini’s The Young Family (2002) depicts transgenic beings—organisms into which genetic material from an unrelated organism has been artificially introduced. The artist collaborates with specialists from various fields of contemporary industrial manufacture to make her ideas a reality. Constructed using silicone, acrylic, human hair, leather, and wood, the sculpture shares human and animal features, eliciting both disgust and empathy from the viewer. 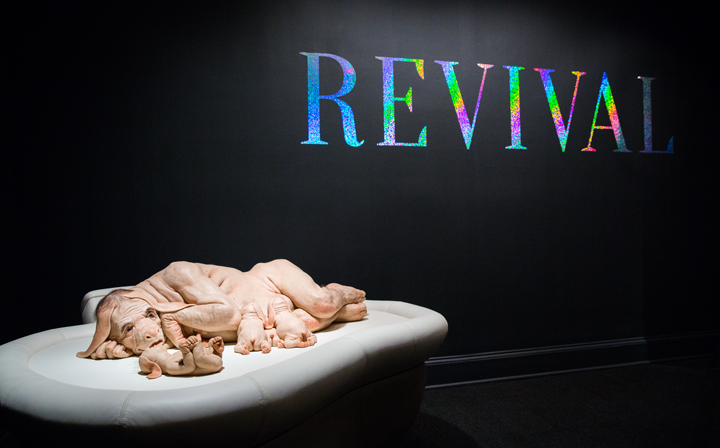 Piccinini’s imagining of these hybrid creatures takes the form of a mother figure nursing her young. The central creature seems to have a familiar, maternal gaze, but also appears to have much more alien physiognomy. This unsettling juxtaposition sparks conversation about society’s preparedness for the ethical and emotional results of genetic manipulations. The Huffington Post features NMWA artist Amy Sherald’s paintings. Sherald portrays her subjects with charcoal-gray hues against vibrantly colored backgrounds. The Huffington Post celebrated the anniversary of Frida Kahlo’s birth with the artist’s own words of wisdom. Rebecca Louise Law hangs over 8,000 flowers in The Beauty of Decay and plans to re-purpose the deteriorated flowers. 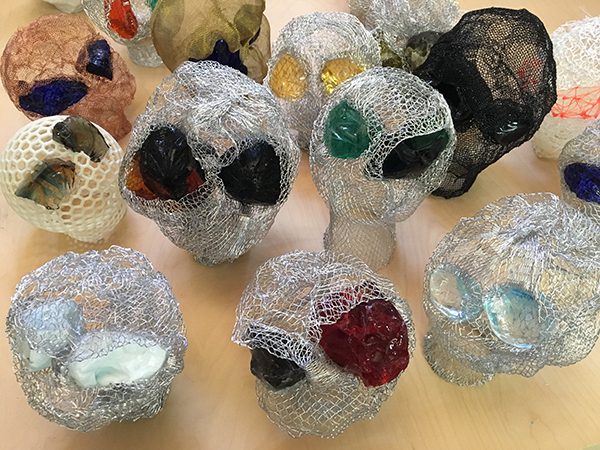 Shirley Tse describes her sculptures, gems for eyes, carving Styrofoam, and Oscar Wilde. Martha Rosler explores gentrification and homelessness in the exhibition If you can’t afford to live here, mo-o-ove!! Through knitting and crochet, street artist Julia Riordan creates rainbow-colored installations around Stockholm. At Fort Tilden in Queens, Katharina Grosse painted a cinderblock building damaged during Hurricane Sandy. Valeria Napoleone displays works from her private collection of contemporary art by women for the first time. MK Guth curates an experience for two friends to sit, drink whiskey, and read a poem by Charles Baudelaire aloud. The Art of Romaine Brooks highlights the work and life of a long-marginalized early 20th-century artist. ARTnews goes behind-the-scenes of Lili Bernard’s Los Angeles studio. Hyperallergic highlights Melanie Manchot’s two-part video installation shot in the Swiss Alpine valley of Engleberg. 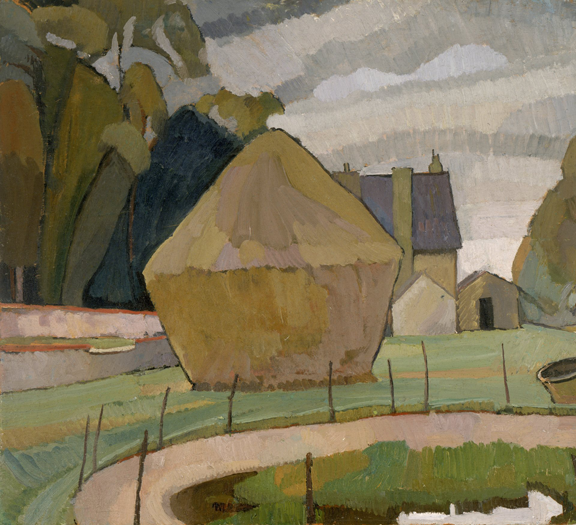 A new solo exhibition for Vanessa Bell—Virginia Woolf’s sister—explores the talent of the pioneering British artist. After 50 years of choreographing, Twyla Tharp reflects on her career. Actress Noel Neill, known for her role as Lois Lane in The Adventures of Superman, died at the age of 95. Mexican artist Mare Avertencia Lirika tries to redefine rap with feminist messages. Bustle highlights 19 women-led bands to listen to. Though trained as a visual artist, Cammisa Buerhaus and her musical work involving a “sculptural pipe organ” defy easy categorization. 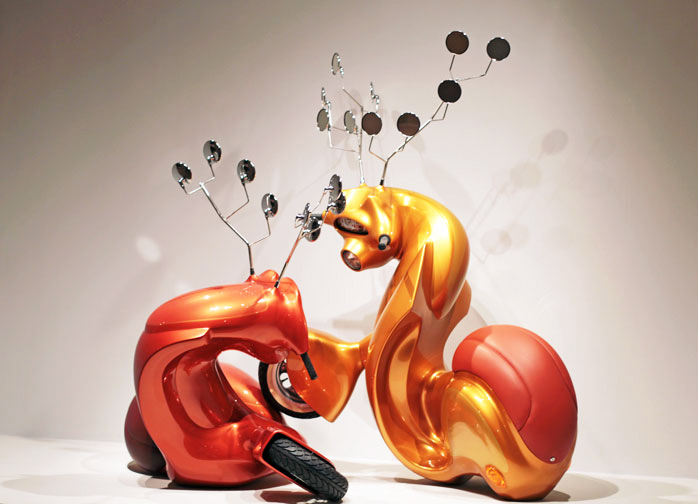 NMWA artist Patricia Piccinini presents surreal sculptures, drawings and a video work in San Francisco. The artist explores themes including of genetic variation and modification, the natural versus the unnatural, and love and parenthood. Carmen Herrera’s paintings of brightly colored geometric paintings will be on view at the Whitney Museum of American Art in September. Herrera, now 101-years-old, sold her first work late in life—at age 89. Katherine Joseph—Every Minute Counts on view at the Oregon Jewish Museum and Center for Holocaust Education presents a vision of Roosevelt-Era social and political culture through the lens of photojournalist Katherine Joseph.